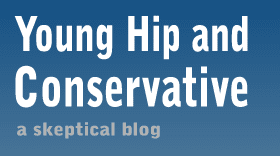 Young, Hip and Conservative: a skeptical blog: "You're smart, it's everyone who agrees with you that's stupid"
"You're smart, it's everyone who agrees with you that's stupid"
A lot of my friends are liberals and as such I regularly witness conservative bashing, either in person or over the Internet. What's odd is I will have a friend go from telling me how much they respect me and and my intellect, to immediately sneering at everyone who holds the same views I do. One moment I will be a shining star, and the next I'll hear how everyone who stands up for issue X is stupid, evil, insincere and even insane, even if they know I support X. Even more telling is the open hostility I'll get from friends of friends who see something I write in an online conversation. It's as if I had just donned a Klansman robe. I realize peoples online interactions can be ruder than in person, but there should be more constraint when you know a loved one is friends with the person and will probably see everything you write. 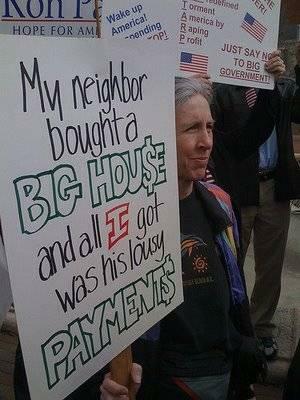 I believe the Tea Party is correct in all the major issues they advocate politically. 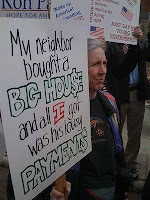 I don't call myself a member, but I went to the first protest on April 15, 2009 at our state capitol. I was given a turn at the microphone and told the crowd exactly what I thought and was applauded heavily. I told them I think public protests are a waste of time but since we're here we now have an opportunity to network with each other and exchange contact information. I attended because I expected to see a caricature of the protests online and in the news, which has proven true. Critics simply cherry pick a few statements or protest signs from nutcases to mischaracterize the group. I find claims that opposition to President Obama is motivated by racism to be shallow and wishful thinking. I think he is a weak president and fundamentally fails to understand how the world works. In addition, my biggest problem with George W. Bush was his big-government economic policies. I didn't like his social conservatism either, but that's secondary. I support the free market and capitalism. I think it's the government that creates monopolies and if capitalism can handle a problem then it should be used instead of governmental interference. For example, I oppose all price gouging restrictions, as they harm people's ability to get the supplies they need. I want America to try a free-market based health care system. I think it's government interference that inflates the cost of health care and college education and it's government interference that caused the current recession. I think welfare programs and the minimum wage cause poverty. I think foreign aid harms the poor while sweatshops help them. I don't like government programs that help small businesses at the expense of large ones. I have zero problem with factory farming and I oppose subsidizing small farms, as I see no virtue in them. The only sustainability problem I'm worried about is Social Security. I think fascism is a form of socialism and I think the Nazis had a lot in common with the American progressive movement at the time, as outlined in Jonah Goldberg's book Liberal Fascism and while I don't think most of the left are socialists, I think some of their policies are. I think Karl Marx cemented his entire philosophy on the unrepresentative city of Manchester and lacked the intellectual discipline to change his mind when proven wrong. I don't think he contributed anything of importance and his popularity in colleges is a scandal. I think the media has a liberal bias. I don't think it's a conscious plot, and it also tends to side with underdogs and people who are willing to talk. I don't think Fox News has reached some sort of peak of bias, and I see it as no worse than PBS, CNN or MSNBC. I am glad the Supreme Court ended the ban on corporate speech and I have no problem with wealth inequality. I love guns, meat, genetically modified food, fast food and Walmart. I think the biggest threat to freedom of speech is the left. Occasionally I listen to Glenn Beck, Bill O'Reilly and Rush Limbaugh, although I prefer Russ Roberts, Mike Munger, Tyler Cowen, Don Boudreaux, Friedrich Hayek, Milton Friedman, Frédéric Bastiat , George Will and Charles Krauthammer. So dear friends, you have a choice to make. Either change your notion that holding a selection of these ideas qualifies someone for villianhood, or significantly lower your opinion of my intellect and motivations. I think the biggest factor in dismissing people with opposing political beliefs is the prejudice and stereotyping of rival groups demonstrated in the Robbers Cave experiment of 1954. Two competing groups of strangers quickly became hostile to each other. They perceived their own faction as a diverse cluster of individuals, but saw the other group as homogeneous and interchangeable. What better way to describe America's left and right. Politics cannot be reduced to a simple good versus evil battle. It's an impossibly complex mess of balancing endless value judgments. It's not easy and waxing superiority over your opponents is an exercise in vanity. A real flexing of intellectual muscles comes in understanding ideas one disagrees with, instead of assuming the worst of motives for their supporters. Update: I am not criticizing conservative bashing - I do it too. I'm calling attention to people who tell me "you're different" and I see that as mere extension of tribalism - that I'm not different, and they are imagining some right-wing bogeyman holds all of these beliefs. The only reason they see me differently is they have met me. People's responses are very different to strangers with identical beliefs to mine, such as my example with hostile friends of friends. A typical university-trained leftist might concede major conclusions when pressed in honest argument, but they will quickly revert to painting the right as cartoon villains as soon as they return to polite company. They don't really care about the ideas. They care about being liked by all the other smart people. Characterizing the right as bigoted or stupid is an easy way to let the other smart people know you're one of them. What an excellent quote by Solzhenitsyn! I think it's important that we emphasize what the Robber's Cave experiment teaches us. It's also a necessity to let our friends (your liberal ones, and my conservatives) that we're not exceptions to the rule. We're all Americans who want to make our country better. We're all human beings struggling with the handicaps of our own humanity. We're all on the same team. A typical [corn-fed conservative] might concede major conclusions when pressed in honest argument, but they will quickly revert to painting the left as [atheist Stalinists] as soon as they return to polite company. They don't really care about the ideas. They care about being liked by all the other [corn-fed] people. Characterizing the [left] as [elitist] or [narrow-minded] is an easy way to let the other [corn-fed] people know you're one of them. I thought Michael talked about stereotyping in this blog post. That's a good point Jeremy. I went somewhat out of my way to make my conclusion as universal as possible. I've never doubted that most lefties have nobel intentions, as I went into more detail in the "evil" hotlink towards the top. The Robbers Cave experiment wasn't about one of the two teams having these views - it was about both of them being doing it. I am not sure that I am the best person to write a rebuttal, I am a social liberal, however fiscally I hold very conservative viewpoints. I think this comes from studying monetary issues somewhat at length. I do not enjoy being lumped in with the typical liberal any more than most conservatives enjoy being lumped in with the typical conservative movement. This is mainly because I feel it strips me of nuance and deprives me of individuality, no matter how true it may be. To the issues at hand, which appears to be an overriding message of anticonservatism, and exceptions made for “the good ones.” I think this bias may not entirely be the fault of the average liberal. While the Democratic party is disjointed, unsure of its message, or even what is worth fighting for the republican party has stood up and become a unified force. This is true on several levels of the party, including general punditry, voting, and means of furthering the party. The article says “I don't think Fox News has reached some sort of peak of bias, and I see it as no worse than PBS, CNN or MSNBC.” I wish to substitute a synonym, and retort that they have in fact reached the pinnacle of bias. They have taken bias and honed it into a finely crafted product worthy of adoration and disgust. MSNBC is of course biased, but it isn’t very good at it. It wishes that it had the viewership, the personalities, and the influence of FOX news. This of course does not stop MSNBC from employing the same strategies as FOX. I think the worst innovation in all of TV journalism is intonation of voice. Edward R Murrow and Walter Cronkite had a soothing respectful monotone, while today we are left with glenn beck tilting his head sideways saying everything with a snarky tone and Rachel maddow squinting her eyes and sarcastically whispering whatever she thinks is a clever comment. Republicans have also perfected the art of voting. They have managed to do what the Democratic Party could never manage, voting together in a single block. This is an effective strategy with side effect of having people generalize the party, and in some cases with causes that republicans don’t even believe in. To tow the party line Olympia snowe voted against aid for 911 workers, despite being a longtime advocate of healthcare for underprivileged. This made a clear statement to senate democrats, but also enforced the idea that republicans can be lumped together as a single unit. These are the messages that are bombarding liberals, that the Republican Party is a singular unit and if someone happens to agree with even a single liberal idea, “gay marriage, drug legalization and open borders,” then perhaps they are one of the “good ones.” So don’t treat your liberal friends too harshly, the idea of republicans being multifaceted and capable of conflicting ideas is confusing and unfamiliar. If it counts for anything I have never said you are one of the good ones. Your generalizations about conservatives may be true Jeremy, but I have far more experience with the university-trained leftist, so I draw generalizations from that experience. And really, the generalization should be wider. Many of the "just trying to fit in with the smart crowd" lefties are not university-trained. They're just trying to make up for their lack of university training. And to widen this generalization beyond the left: most people would rather be well-liked than be right. Self-esteem comes from the approval of others, rather than from a rigorous application of rationality to reality. Kevin, that's some good food for thought. It never occurred to me that people could shape their view of the rank and file righties by the cohesive behavior of the righties in Washington. I can argue that there's a gap between the actions of elected officials and the way they vote and the views and opinions of the voting public, and I truly believe that, but it's irrelevant. Even if it's not rational, seeing those figures probably has some impact on the opinions the public forms on conservatives. The bottom line is, when our elected officials disappoint us they have often said they are speaking for their constituents. Who, then, are these constituents if we are not they?